Competition Take Off Board Foundation Equipment for Long Jump and Triple Jump. 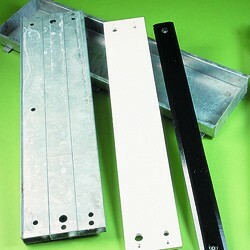 This consists of a galvanised steel foundation trough with a galvanised steel take off board accommodating a timber take off board and timber no jump indicator with metal backing, galvanised steel blanking board to cover trough when take off board not in situ, 2 x rolls of plasticine and 1 pair of lifting hooks. Note: Each individual item is available separately. Replacement timber inserts can be purchased undrilled to ensure they will fit any manufacturer's equipment.